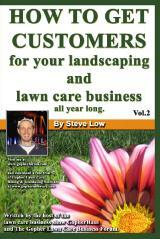 « Starting a lawn care business with next to nothing. Buying new lawn care equipment can save you with repair headaches. They are less prone to breaking down and you usually have a dealer warranty that covers repair issues that pop up. The down side though is the price. If you are trying to save some money, you could consider doing what these other business owners have done and buy used. As we will see from this discussion on the Gopher Lawn Care Business Forum, there is a difference between buying used equipment and abused equipment. A second lawn care business owner said “let me be the first to say there is a difference between buying USED and buying ABUSED lawn care equipment. But I don’t have a problem buying used, letting someone else take the hit on the deprecation of a new piece of equipment. I’m not caught up with the hype of having the ‘latest and greatest’. Yes, there are some innovations that do make a difference, but far too many of them are simply marketing ploys that are directed at separating a buyer and his money. Now, this works for me and I also understand it is not a universal truth for everyone. I can see where a large company would want new. But as a single owner / operator, working part time, making between $18-25K a year, used works well for me. Every piece of gas powered equipment on my trailer was purchased used. And the total cost for the walk behind, 2 push mowers, 2 trimmers, edger and blower AND trailer, was less than $1,200. Keeping my overhead down keeps my rates low and allows me all the business I can handle. A third added “buying used is not the worst thing if you know what your looking for. Rule no. 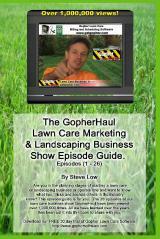 1 Do not buy used equipment from larger lawn/landscape company’s. Generally their equipment is operated by many different lower wage people that don’t give a damn about taking care of it because it’s not their investment. There are exceptions don’t get me wrong but generally this holds true. I have found some gems like my current 62″ ztr with 200 hours for $4,500.00. That same mower new listed at $9500.00. The guy I bought it from was a solo operator and he used that thing for 1 account for 2 years before getting out of the business and having no more need for it. I found my 48″ Stander the same way with 195 hours. The guy ran it for 1 apartment complex account. I paid $3,700.00 for it. I can see the benefit to buying new especially for the larger companies. They can write the equipment off as well as have the dealer service them more regular. This entry was posted on Wednesday, December 5th, 2012 at 5:19 pm	and is filed under Back Pack Leaf Blower, Debt, Lawn Care Business, Line Trimmer, Mower, Overhead Costs, Trailer, lawn care equipment. You can follow any responses to this entry through the RSS 2.0 feed. You can leave a response, or trackback from your own site.